A t-shirt quilt can preserve fun memories that you don’t want to let go of, even once you’re done wearing the shirt for good. To make a quality quilt, you’ll need interfacing. This extra material will make your final design stronger and more symmetrical. Perhaps you already know how to make a t-shirt quilt. If not, learning how is the first step. One of the main reasons people love t-shirts is because of their comfortable, stretchy material. 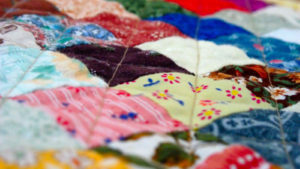 Once you decide to use them to make a quilt, however, this stretchiness creates an issue. The characteristic that makes your favorite t-shirt so soft and comfortable also makes it crooked and distorted if you sew it into a quilt without the proper preparation. Inexperienced quilters may have already learned this the hard way. If you haven’t, save yourself some time and make sure your shirts are stabilized before using them in your next sewing project. This can be done with fusible backing (also known as interfacing) applied to the fabric. This backing will help the squares of fabric maintain their original shape, even as you sew and cut it. The older or softer your t-shirts are, the more important this step is before you begin your quilting project. To make your t-shirt quilt, you must first decide on how you want the design to look. Next, you will cut the squares of fabric you want to use for your quilt, typically cutting around the logos on the front of the shirts. Once you have sewn your quilt top, you will need to start thinking about interfacing. This will require the interfacing itself, an ironing surface, and a steam iron, in most cases. You may also need a damp cloth.